Designed to replenish dry skin, promote the formation of new cells, improve circulation, and to help repair sun or heat damage. 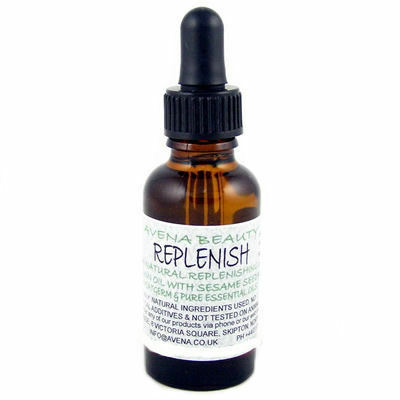 Replenish skin oil is made with a careful blend of Rose Absolute, Frankincense and Lavender pure essential oils in a base of organic Wheatgerm and Sesame Seed Oils. Designed to replenish dry skin, promote the formation of new cells, improve circulation, and to help repair sun or heat damage. Use on the face, hands or body. Apply 2 - 3 drops to the area required using the pipette supplied and massage into the skin. The gentle Sesame and Wheatgerm carrier oils will ease the essential oils into the skin leaving a soft and velvety feel without an oily residue. A beautiful and luxurious aromatherapy blend made with oils reputed to heal and revive skin. Part of the Avena Natural Beauty range making a lovely gift idea or lovely treat for yourself and your skin. This product contains only natural ingredients with no chemical additives. It is parabens free and SLS free. None of Avena's products are tested on animals.